Neon signs can brighten up (literally and figuratively) any space inside the home. A little bit of creativity and a great concept can go a long way when it comes to transforming a neon sign into a type of interior decoration. Neon signage is pretty versatile and you can use it in a number of distinctive ways when redecorating or modernizing your home. here are a few great ideas to help you get inspired. Instead of a poster or a painting, you can add a neon sign above your bed. The gentle glow will enhance the ambiance in the room and help you relax. Not only that, the selection of the right sign can actually contribute to a more meaningful bedroom décor. Choose smaller and more subdued signs for this living space. Remember that the bedroom is supposed to encourage relaxation. Bigger and brighter signs are not a suitable choice and they should be reserved for another part of the apartment. Vintage neon signs often carry fun messages that can be incorporated in interior design to give warning or welcome someone in a specific room. A “keep out” sign, for example, is a great addition to the door of your teen’s room. 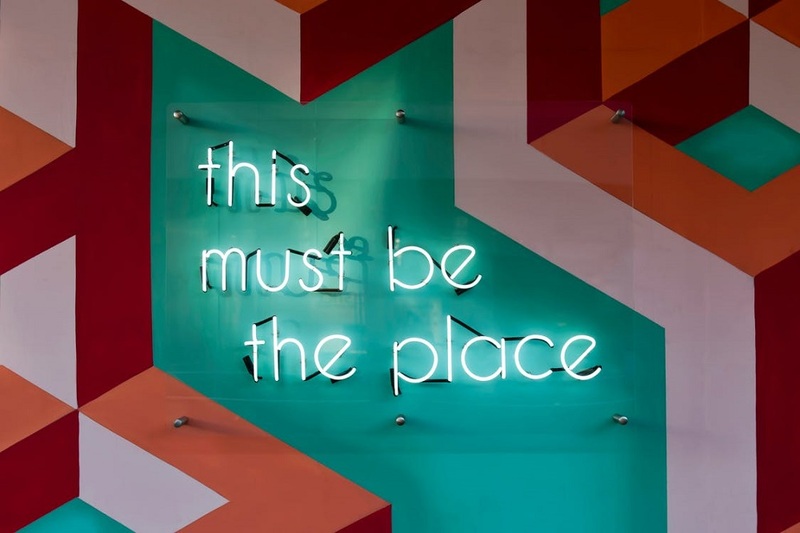 In order to get the best possible outcome, choose neon signs that are stylistically similar and that will fit inside the same interior design concept. The living room is the place you can go wild during the execution of a home improvement project. Traditionally, the living room walls are covered in family photos or art. Standard choices may include posters, pictures, black and white photography, mosaics, quilts or mirrors. Neon signs can take these decorative efforts to a whole new level. You can easily buy neon signs online to simplify the process of conceptualizing and executing the interior design improvement. To make the appearance of a wall impressive, opt for multiple signs. They will work together to create a feature wall that carries a bit of retro appeal. A good collection of old signs can be really stylish and a bit masculine. This is why you have to choose the elements carefully. Know what message you’re opting for and research signage accordingly. Some neon signs are a bit more limited in appeal and they should be utilized if you have a man cave or a home bar where you like to entertain guests. There are some neon signs out there that come with adult themes or joke statements little ones will not understand. In addition, some family members may find such messages a bit tacky or distasteful. This type of signage should be utilized a bit more exclusively in the home modernization project. For best results, use such signs in the room where you entertain companies or spend quality time with friends. The beer neon sign will give you the vibe of an actual club or a bar, leading to the complete transformation of this domestic space. Apart from opting for signs, you may also want to consider the addition of neon lights to certain parts of the house. Neon lights should be positioned above or below important pieces to highlight their appeal and give them some futuristic glow. This way, you can accentuate parts of the room that you want to make instantly visible. Take some time to find the right neon signs – there’s a wide range of option out there. If you already have a home improvement concept, base the selection on the theme. Alternatively, browse through different signs online to get inspired and to narrow down the interior design project style.